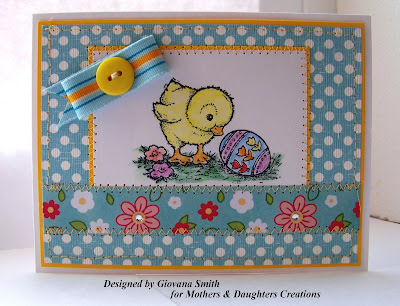 Mothers & Daughters Creations Thursday Challenge and Blog Roll!!! 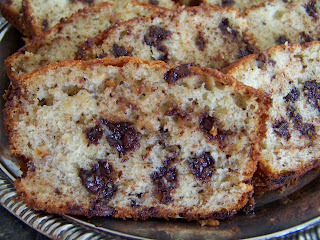 Thanks for joining the very first Mothers and Daughters Creations Mother’s Day Traditions Blog Roll. You can find all of the exciting details about this blog roll on the main "Mothers & Daughters Challenge Blog", where our own Mother and Daughter Team of Linda and Tam will be sharing some very special Mothers Day memories and traditions. 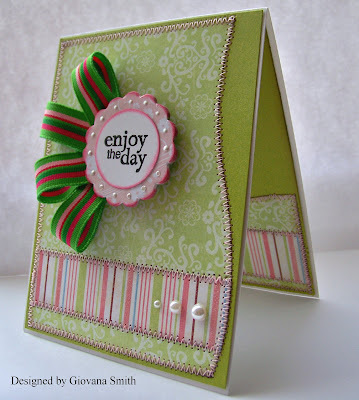 This week Cathy is hosting the weekly card challenge for MDC on her blog, The Seaside Rose Cottage, and she’s offering some sweet blog candy –: Bo Bunny papers along with key lime and strawberry ribbons. 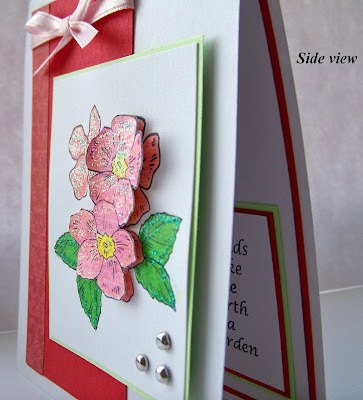 All you have to do is create a card with multiple layers, easy peasy!! 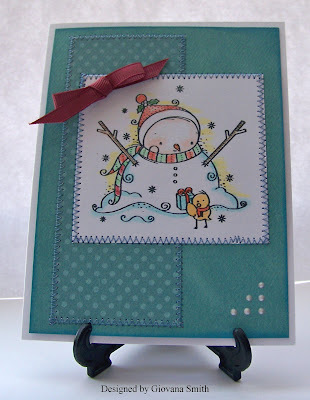 Here’s my card for Cathy’s challenge: Layers!! : Cute Patootie. Another baby card, lately I've been creating baby cards, our church is growing!! Just last week two wonderful ladies have their babies the same week!! 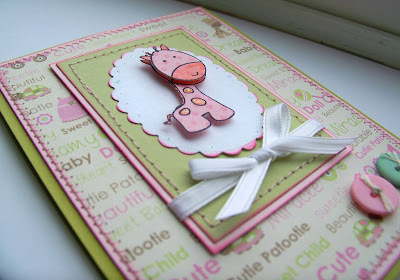 For my card I used a pretty paper from Imaginisce "Baby Powder- Cutie Pattotie. The image is also from Imaginisce: Snag'em Collection: Giraffe. 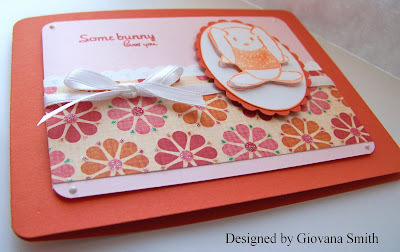 I stamped the image twice on Tutu Dot Bo Bunny Paper . The image was colored with Markers. I added some Diamond Stickles on the giraffe spots. 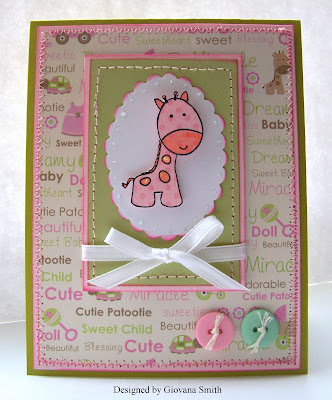 Card Stock: Kiwi Kiss, Pink Pirouette, White. Embellishments: Offray Satin Ribbon, Buttons, DMC thread. Accessories: Sewing machine, pink thread, SU Dimensionals, Mini glue dots, sponges. Hope you like it, now be sure to visit Cathy’s blog for the challenge details and a chance to win some blog candy. 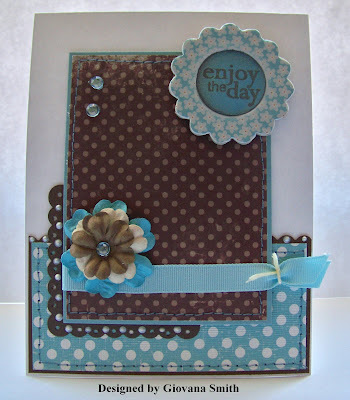 You can also see some more terrific cards that Melissa and Leah made for the challenge on their blogs. 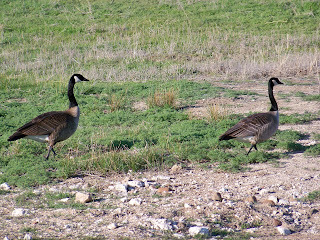 Canadian Geese trying to find a place to make a nest. This couple was a lot of fun. 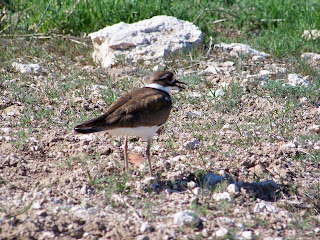 Mamma Bird: That's how we call her. 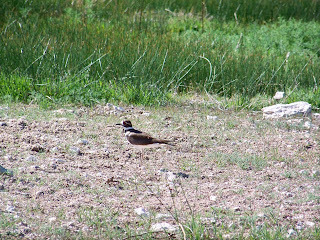 This is the 3rd Spring in a row she is back to make her nest here. The only complain: She is TOO LOUD!!! She starts chirping around 4:00 am and never stops. Her babies thought are always cute, LOL. You can't see it but her eyes are Real RED!! 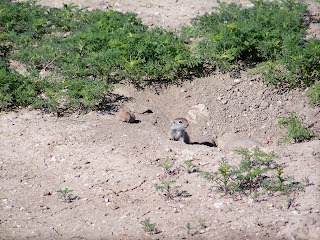 And last, this critter (as I call them) here you can see only one, but it was a whole family of 8!! This is a Sage Rat Baby, they look cute, but they destroy your yard, well, I can't say I have a nice yard, but we don't want them either. Oh well, I didn't have a card to show today, so I thought I would share this with you. I took all these pictures with my new camera and I used 20X zoom. 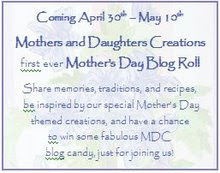 Come back tomorrow and enjoy our First Mothers & Daughters Creations Blog Roll!!! Prizes and challenges everyday. smARTworks Tea Party #17: Yellow!! Hello my friends, it's time for another smARTworks Tea Party. This time Peggy is hosting the Party and challenging to use "Yellow" in our creations. Yellow, so shiny and bright, very springy and warm. So let creative and show us what you can make. We will be posting our creations on May 6th. 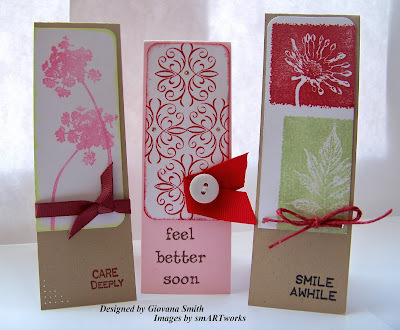 You have the whole week to create and get inspired, also you don't need to use smARTworks stamps. Hello my friends, I have a very simple card for you today. I have to confess that these are not my colors, but after playing with some CS I thought they look pretty good together. This time I used Journey Set from smARTworks. Again, I used my Prismacolor Pencils, I had fun coloring, but of course I need more practice, what do you think? Card Stock: Yellow, Green, Whisper White. Accessories: SU Dimensionals, Prismacolors Pencils, OMS, Mini glue dots. Hello everyone, I have a Baby Girl card for you today. 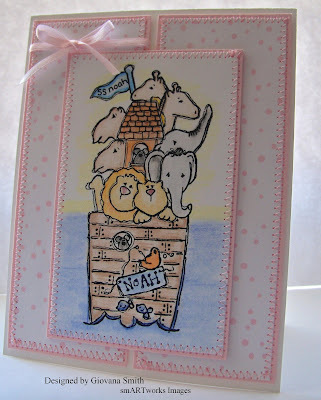 For this card I used Noah's Ark Image from smARTworks. I stamped the image on Whisper White Card stock using Stazon Black Ink. I colored the image with Prismacolor Pencils and OMS. I have to say I am learning how to color with OMS, it is not as easy as I thought, but I am practicing a lot. Card Stock: Whisper White, Pink Pirouette. Paper: Pink Splatter ( Making Memories). Stamps: Noah's Ark by smARTworks. Accessories: Sewing machine, Pink thread, Prismacolor Pencils, OMS, Mini glue dots. I hope you like it. I would love to hear your comments. Hello my friends, this morning I played4 challenges from Mini VSN on SCS. I am show casing products from "Mothers & Daughters Creations Store" Enjoy!! Challenge #1: Bellie up to the Buffet! and head straight the dessert cart, girls: Buttons, Brads, Glitter,Dew drops, Punches, Sewing, Ribbon, Eyelets, Rhinestones. 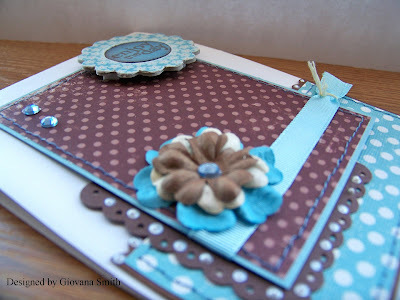 Paper: Aquamarine Dots by Bo Bunny. Accessories: Sewing machine, blue thread, Mini glue dots, Prismacolor pencils, OMS. 1 point for each layer in the card. 1 point for each hard embellishment (brads, eyelets, charms, rhinestones, beads, clips, etc. SO, a hairpin with four beads on it counts as 5 points). 5 layers = 5 points. 3 Patterned papers = 9 points. 1 stamps = 5 points. Paper: Royal Process by Imaginisce, Magic Meadows by Imaginisce, Playful Petals-Gabby by Daisy Buckets. Ink: Stazon Black, Light blue, Gold. 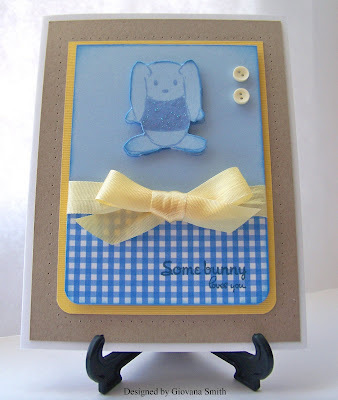 Accessories: Rub-Ons by Bo bunny, Sewing machine, blue and pink thread, sponges, mini glue dots, 3D Foam. Challenge #3: Gold, Gold and more gold, using something gold in our project. Card stock: White. More mustard. Embellishments: Martha Stewart Ribbon, Gold thread. Accessories: Embossing gun, embossing powder, 3D foam. Card Stock: White, Kraft, More Mustard. Black. Accessories: Sponges, Prismacolor pencils, OMS. Hello again, I have a cute and pretty card to show you. I played Ways to Use it today. Today's challenge was "White, white, white", just using White card stock!! Oh my, hard to use only one color, so I decided to add a bit of More mustard (I hope I am not disqualified, LOL). 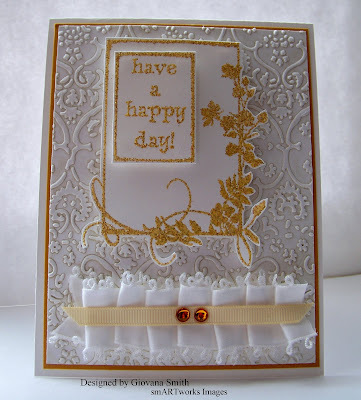 I embossed a piece of Whisper White CS using Cuttlebug and Textile folder. The frame and sentiment are from Frames Set. I hand stitched the white ribbon and added a piece of Grosgrain Ribbon on top. Also a couple of Rhinestones. Card Stock: Whisper White, More Mustard. Ink: White Craft, Gold Craft. Accessories: Cuttlebug, Textile folder, Gold Embossing powder, Heat gun, Mini Glue Dots, 3D foam (EK SUccess), pointy scissors. PS: Sorry about the dark picture, here is very dark today and my battery was not all charged, I will try to post a better picture later, Thanks!! Hello my friends, I hope you are having a great day, here the weather is crazy again, cool, windy and gray. I've been feeling a little sad lately, my cousin is sick, but she has a good spirit and even though she knows her health right now is not the best, she knows she can conquer one more time another difficult situation. I just need something to make me feel better. I've been playing more than usual with DD, she loves to play Wii Play ( Find the Miis), over and over, sometimes I have to say, no more. She also loves to do Wii Fit, she is so funny and whatever her scores is, she gets so excited, LOL. 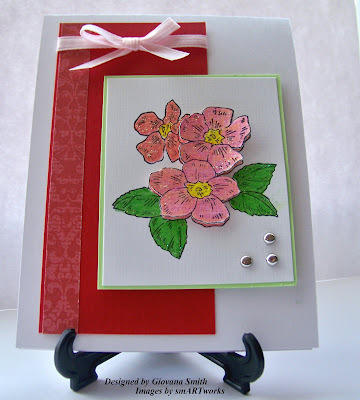 Anyway, I made a card for Cafe Mojo, this is a blog with fun challenges, and this time Mothers & Daughters Creations is sponsoring the challenge and giving away $15.00 prize in MDC products. The challenge is to use ribbon in a non-traditional way. 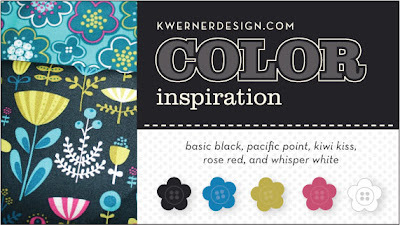 Card Stock: Kiwi Kiss, Whisper White. Paper: Enchanted Garden, Baby Powder - Oopsie Daisy, Sweet Satin Ribbon all from Imaginisce Designed Paper. 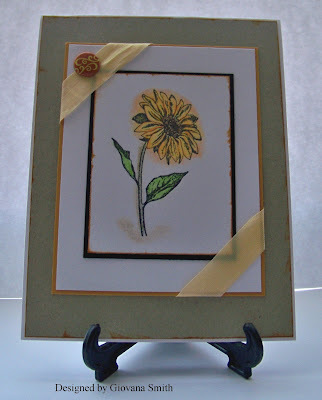 Stamps: Enjoy from Daisy Bucket. Embellishments: Grosgrain Ribbon by May Arts, Kaiser Pearls, Liquid Pearls by Ranger. Accessories: Sewing machine, pink thread, Mini glue dots, 3D foam (EK-Success), SU Chipboard, sponges. smARTworks Tea Party : Shaped cards!! Hello my friends, it is time for another smARTworks Tea Party, today I am hosting the Party and I had challenged you to create "Shape cards". Believe it or not I had a lot of ideas for this challenge, and I tried them all, sometimes not good results, but I kept the ones I like the most and I have 3 cards to show you !!! 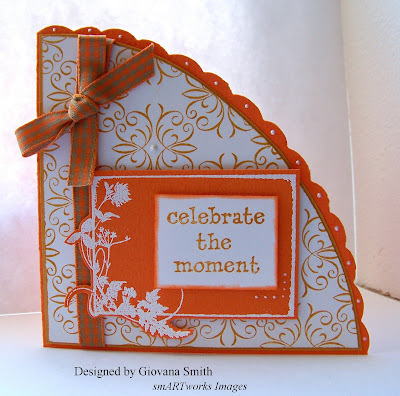 Celebrate the moment: For this card I used the small stamp from Frames set and with the help of my stamp-a-ma-jig I started stamping using More Mustard Ink. 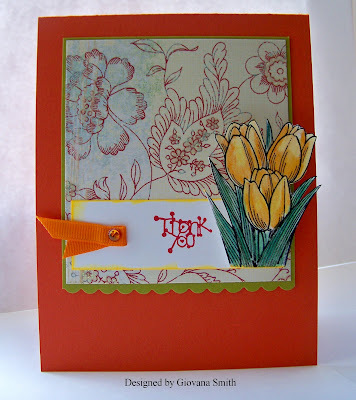 The frame was stamped in Orange Cs using White Craft ink and heat embossed in White ep. I used Scallop scissors for the border of my card. I added little drops of Liquid Pearls and I attached some yummy ribbon. Card Stock: Orange, More Mustard, White. Ink: More Mustard, White Craft. Embellishments: Bobbin Ribbon, Liquid Pearls. Accessories: Stamp-a-ma-jig, Mini glue dots, SU Dimensionals, White embossing powder, Embossing gun, Provo Craft Scallop scissors. 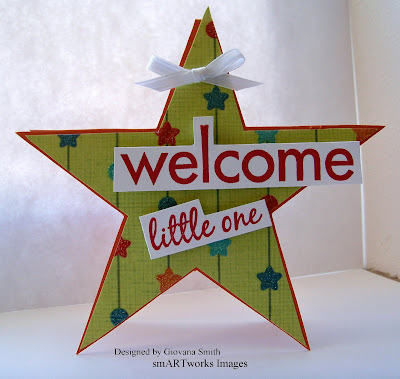 Welcome Little One: This card is very simple, I created a template on Windows Power Point and then traced it onto my CS. 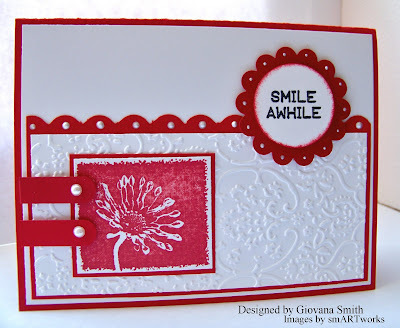 I stamped the sentiment from Combo Sentiment Set in Whisper White CS using Real Red Ink. The BG paper is perfect for this card, it has little glitter stars!! I added a little bow on top. Card Stock: Tangerine Tango, Whisper White. Paper: Just Dreamy by My Mind's Eye. Accessories: Mini glue dots, SU Dimensionals. 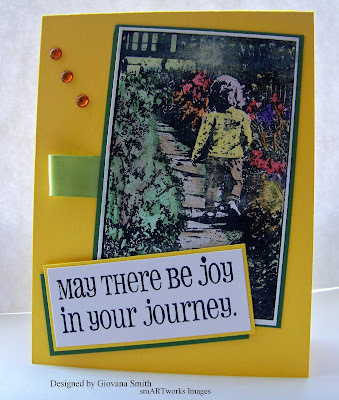 Be Joyful: This card is really pretty. It took a while to make it, but at the end I was very happy with the results. 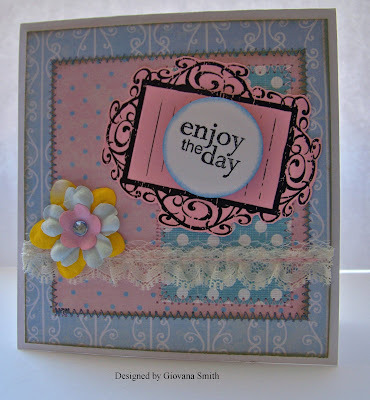 For this card I used 2 smARTworks sets: Cookie Plate #1 and Buttoned Up. 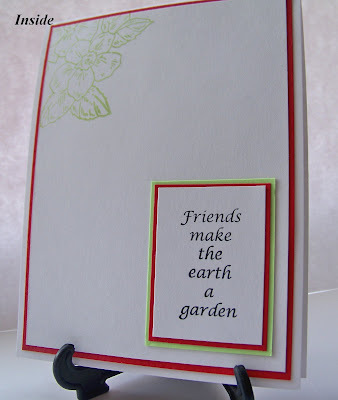 I stamped the leaves on Whisper White CS using Certainly Celery Ink, then using the same image I used Real Red and Orange Ink just to stamp the flower area, after that they were cut out, I also stamped the single flower from Buttoned Up set in Pretty in Pink Ink and cut them out. The sentiment was stamp in Read Red. Card Stock: Whisper White, Red. Stamps: Cookie Plate and Buttoned-Up. Ink: Real Red, Certainly Celery, Orange, Pretty in Pink. Accessories: SU Dimensionals, stamp-a-ma-jig, Coluzzle, pointy scissors. I hope you like my creations and also you have some time to play along too. Remember, you don't need to use smARTworks stamps. Now, head over to Susan (for Peggy and Sarah's too), Dina, Trish, Donelda and Donna and enjoy their creations too. smARTworks news and a card! Hello my friends, I hope you are having a great Monday, here is nice and warm. Last weekend was a very busy weekend, I didn't have any stamping time. I have a card to show today and great news from smARTworks. Now onto my card, I used Cookie Plate #1 set. 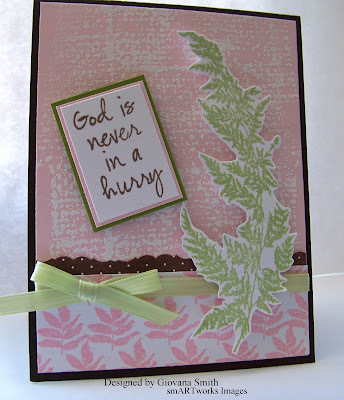 I stamped the leaves on White CS using Certainly Celery Ink, the sentiment was stamped in Basic Brown Ink. 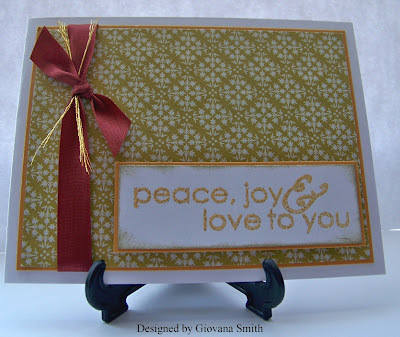 The BG is BG 12- Weave stamped in White Craft and then heat embossed with White ep. 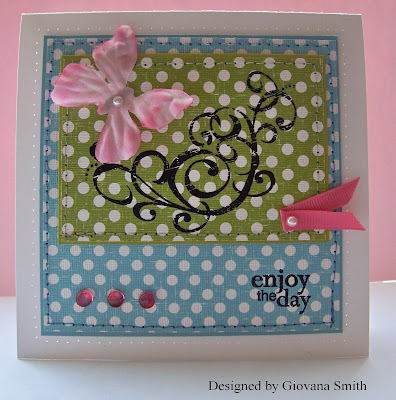 The lower part was stamped in white CS using Pretty in Pink Ink and stamp-a-ma-jig. 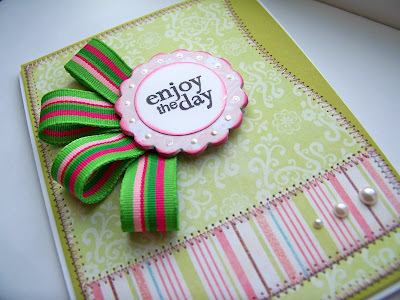 Card stock: Brown, Pink Pirouette, White, Green. Stamps: Cookie Plate #1, BG12- Weave. Ink: White Craft, Pretty in Pink, Basic Brown, Certainly Celery. Accessories: stamp-a-ma-jig, Mini glue dots, 3D foam- EK-Success, White ep, embossing gun, Provo craft scissors, scissors. Labels: smARTworks news, smARTworks stamps. Hello my friends, I hope you are having a great day. Since I finished all my cards yesterday for the Verve Challenges, I've thinking about Verve Stamps a lot. I own only 1 set that I love!!! and give it a try again. 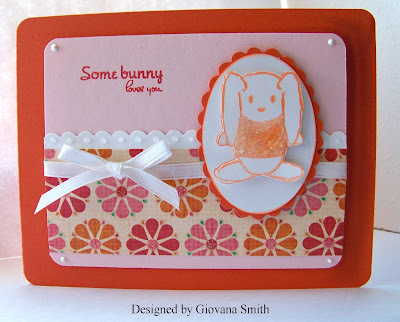 This is Some bunny and I think it is great for baby cards. Tonight, it is Verve Release party so I am planning to be there and enjoy it, also you can have the chance to win great prizes too!!. Card Stock: Tangerine Tando, Pink Pirouette, Whisper White. Ink: Orange (color Box), Riding Hood Red. Hello my friends, I hope you are having a great day, we are having a beautiful day, sunshine!!! This afternoon I played all the Verve Challenges!!! Woo-Hoo!! I started with challenge #1, then #3, #2 and #4, I don't know why, but I did it this way,LOL. I hope you like my creations, if you have any question, please don't hesitate to ask. Card Stock: Red, Whisper White. Embellishments: Pearls by Kaiser, Liquid Pearls by Ranger. 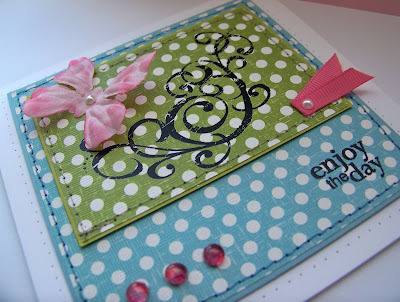 Accessories: Cuttlebug, embossing folder, punch. Card Stock: White, Mellow Moss, Close to Cocoa. Paper: Out & About by My Mind's Eye. Embellishments: Pearls by Kaiser, Green ribbon. Ink: Pink, Clear embossing pad. Embellishments: Red Ribbon, Pink button, Rhinestones (making Memories), Liquid Pearls by Rangers. Accessories: Sewing machine, pink thread, Gold embossing powder, embossing gun, mini glue dots. SU Dimensionals. Card Stock: White, Kraft, Yellow, Bashful Blue. Embellishments: Martha Stewart Ribbon, Mini buttons. 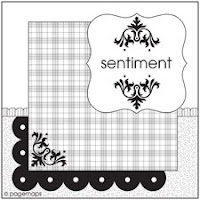 Accessories: Paper piercing set, SU Dimensionals, Mini glue dots, Corner Punch, Stickles. Labels: smARTworks stamps., SU Stamps, Verve Challenges, Verve Stamps. Mothers & Daughters Creations Thursday Challenge and a great announcement!!! Happy Thursday everyone, time for another M&D Creations Challenge, this time a sketch challenge. The sketch this time courtesy of Page Maps. Don't forget to stop at MDC Challenge Blog and have the chance to win great prizes. The sentiment in my card was stamped in a piece of chipboard which I colored first with Blue Craft Ink, after it was dried I stamped the sentiment with Basic Brown Ink. For the flower I glued a piece of forget me not Paper onto the chipboard and then sanded the borders. I hope you like it and play along with us. Card stock: White, Brown, Baja Breeze. Ink: Ble Craft Ink, Basic Brown. Embelishments: Prima flowers, Blue Crystal Rhinestones by Zva, White Opal Liquid Pearls by Rangers, Light Blue Ribbon by American Crafts, DMC embroidery thread. Accessories: Sewing machine, blue thread, Su Dimensionals, Provo Crafts Scallop scissors. And now for our exciting news - our very own Cathy Weider has organized MDC's very first blog roll! This will begin April 30th and will culminate on Mother's Day with a gallery of entries from designers and visitors alike. The theme, Mothers and Daughters Traditions, promises a bouquet of fabulous projects - cards, scrap book designs, gift and packaging ideas, altered projects, and much, much more. Beginning on Thursday, April 30th, grab your cup of tea or coffee and a sweet roll and join us for our daily posts. We'll share fabulous projects, memories, and recipes, inspirational ideas for journaling scrap book pages and writing personalized messages for cards, and the secret language of flowers. Create a card or a treasure box, embellish a picture mat or a scrap book page, test your knowlege of trivia, or simply share a memory and you could win some of the fabulous blog candy we'll be offering each day. Sweet! Be sure to keep posted for further details! Hello my friends, I hope you are having a great day!! Did you hear on the news about the weirdest weather in Washington State?? Yes!! Yesterday from 7 am to 10 am we had snow!!! DD woke me up telling me it was snowing, I got up and yes it was. Around 8 am, the snow shower weather became something like a snow storm, the flakes were huge!!! I didn't know if laughed or cried, after that we had some beautiful sunshine that melted everything, then the day turned gray, dark and darker, lighting and thunders, rain and more rain. So yesterday was one of those days I really don't like. Anyway, today is a new day, bright and sunny and also time to mention about smARTworks Cookie Challenge. Susan sent us Grow On Set and challenged us to create a project with it. I created a card, I stamped the image (twice) in a White CS using Stazon Black, then colored them with Watercolor pencils and Markers. I cut out a couple of flowers and positioned them on top for more dimension. I added some silver brads and ribbon. Pretty simple,but pretty card. Card Stock: White, Red, Gable Green. Ink: Stazon Black, Certainly Celery. 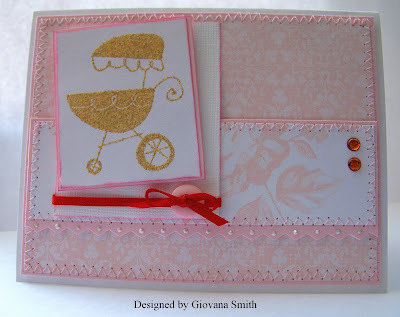 Embellishments: Offray Pink Ribbon, Silver brads. Accessories: Watercolored pencils, Markers, Glitter, stamp-a-ma-jig, SU Dimensionals, Mini Glue Dots. Now, would you like to win this set??? Head over to Susan's blog and answer the question posted there. Good luck everyone!! Hello my friends, this is my time to host the Next smARTworks Tea Party and challenge you to make "shaped cards", just think outside the box, any shape goes!! just be creative. I will post my creations next Wednesday (April 22) and I hope you can play along with me and the DT. Remember smARTworks stamps are not required, just use any kind of stamps you have. Now talking about smARTworks, new stamps have been released and added to the smARTwork Catalog, check them out, they are awesome!!! Hello my friends, I hope you are having a great day. Saturday night we made some plans for yesterday, but anything changed unexpectedly. We were at church and DH was not feeling very well, after our service we returned to home and he took a nap, then another nap and another nap, I was getting really worried because he never sleeps that much. I checked his temperature and it was 102.4, then 103, then 105.4!!! I immediately put some wet cold towels on his forehead, he had a cold bath and after 2 hours!!! he started feeling a bit better, temperature by then 102.4. I don't know what is going on, he just left to visit the doctor this afternoon, please keep him in your prayers. Anyway, yesterday we didn't go anywhere, so I sat down here and checked SCS and I found a very touching post from Jill : Cards for Tuong. I read the story and touched my heart, I believe no child should suffer, please read her story and I hope you feel the same too. Tuong is from Vietnam and she is now in America to have some check-ups and try to figure it out what's wrong with her lungs. Please keep her in your prayers and if you could send her a card, that would be GREAT!! I already sent her a card and some stickers. You can see how beautiful she is HERE . If you would like to send her a card, please send a PM to PJill (through SCS) and she will e-mail you the address. Leslie!!! Congratulations Leslie and thanks so much to all of you who participated in my blog candy. Happy Easter !!! I hope you are having a great time with your family. We are having a family time, will go to church and enjoy our time together. Later we will have dinner together at a local Restaurant and the nwe will enjoy some yummy homemade Chocolate cheesecake. I think with the years every Holiday gets more and more commercial and that is sad. My daughter was talking about Easter the other day, you know bunnies, eggs, new shoes, new dress, but then I asked her what are we celebrating? She looked at me and say Jesus. I explained her what Easter is about, she got it, then when my husband came home from work she was so happy to tell daddy what and why we are celebrating Easter. We don't worship a dead Jesus because He resurrected, He is Alive, Risen!!! Thank you Lord for your love. I hope you enjoy the real menaing of Easter. In other things, I have few pictures to share with you. Last Wednesday I invited my neighbor to have dinner with us, so I made some Yakisova noddles and Banana Bread. 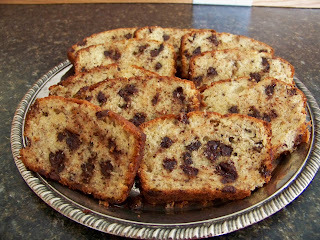 I always add chocolate chips to my BB, it was yummy!! It didn't last for too long, LOL. 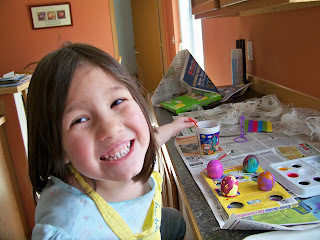 And, on Thursday DD and I dyed some eggs, she had a lot of fun coloring eggas and of course some of the dye inked her fingers and mine too, LOL, Isn't she adorable?? Hope you have a great Family Sunday. Happy Easter and God bless you. Happy Saturday my friends. I hope your day and bright and happy. I really needed to make a Thank you card for Gary (my neighbor's Father-in-law), he let me have all his wife' stamps and I am so thankful for that. I think I got more than 100 stamps!! They are fantastic and I can't wait to show you some of my creations using these stamps. 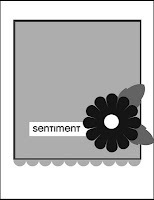 For my card I am using the sketch from Clean & Simple Blog. Do you like the pretty paper? This is one of the paper in my blog candy!! Don't forget to enter HERE, you have until Midnight tonight. Cards Stock: Tangerine Tango, Kiwi Kiss, Whisper White. Paper: Out & About "My Mind's Eye"
Ink: Stazon Black, Riding Hood Red, Orange. Accessories: Scallop Scissors ( Provo Crafts), Mini Glue Dots, 3D foam (EK-Success), Watercolor Pencils. Hello my friends, I hope you are having a great day!! I am enjoying the sunshine right now, even though this morning was really gray, rainy and cloudy. I am feeling better from my allergies/asthma problems, my Mojo is kind of back, LOL, and my husband is sick, poor guy, 102.4 F temperature this morning, I hope Idon't get whatever he is having. Anyway, today I made a card using Kristinas's Color Inspiration #49: Basic Black, Pacific Point, Kiwi Kiss, Rose Red and Whisper White. I have to confess something, until this moment I was 100% sure it was Baja Breeze instead. Ooppss!! Maybe I will try another card with this color instead of Baja Breeze. 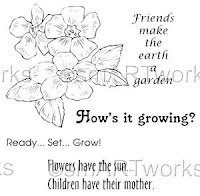 Some products are fom Mothers & Daughters Creations. Card Stock: Whisper White, Baja Breeze, Kiwi Kiss. Paper: Playful Petals - Gabby and Playful Petal-Lucy from Daisy Buckets. Stamps: Enjoy by Daisy Buckets. Embellishments: Butterfly from May Art Ribbons, Pearls from Kaiser, Rub-On from BoBunny, Dew Drops and Red Rose Grosgrain Ribbon. Accessories: Sewing machine, blue and green thread, Mini Glue dots, Paper piercing set. Hello my friends, I hope you are having a great day!! Today I tried to stamp, but my inspiration was (and is) in somewhere land, so instead I decided to change my blog banner, here is not snowing anymore, actually is getting really nice!! Finally Spring is here. I don't live close to the ocean, very sad because I love to go to the beach. In Peru the beach is only 20 minutes from my dad's house, super cool!! Anyway, this picture is not from Peru either, LOL. DH took this picture when he was serving in the Persian Gulf. I really like this picture, brings a lot of peace. Amazing is God who created this beauty!! I hope you like it this way. Have a great day!! Another swimming lesson day, I am already tired. Tea Party Challenge #15: Scraplings!! Happy Wednesday everyone and welcome to another smARTworks Tea Party challenge. This time Donna is hosting the Party and challenging us to do "Scraplings"" Thin long cards (1 3/4" by 4 1/4"), using scraps!! 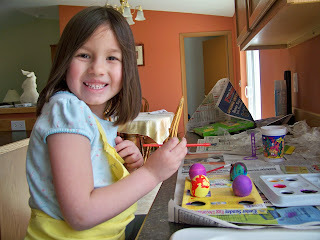 They are alot of fun to make and better yet you can use all your scraps, (cardstock, paper, ribbon, etc). I created 3 scraplings, actually I made 5, but I didn't like how 2 turned out so I decided to not to post them. Card Stock: White, Kraft, Pink Pirouette. 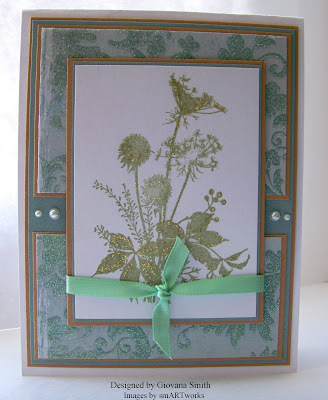 Stamps:SHB-01, Cookie Plate #1:Botanicals, Frames. Ink: Burgundy, Pistachio, Riding Hood Red, Certainly Celery, BasicBrown, Black. Embellishmetns: Burgundy and Red Grosgrain Ribbon, Red twine, White button. Now head over to Susan, Dina, Trish, Donelda and Donna's blogs and check their creations. I hope you can play along with us, you can use any stamps you own, smARTworks stamps are not required. Happy Tuesday everyone, I hope you are having a great day. I am enjoying the great weather we are having right now, 70F is the perfect temperature for me!! LOL, not too hot, not too cold, just perfect to wear a light jacket, this reminds me the movie Miss Congeniality, LOL. Anyway, today after school I was planning to play the Color Combination Challenge, but I tried 3 different things and then I gave up. I really wanted to make a card or 2 or 3, hehehe, so I checked into my bag of MDC supplies and I decided to color and play with these super yummy papers. on the left corner and a couple of Mini Clear Crystal from ZVA in the flowers. Card Stock: White (GP), Summer Sun. 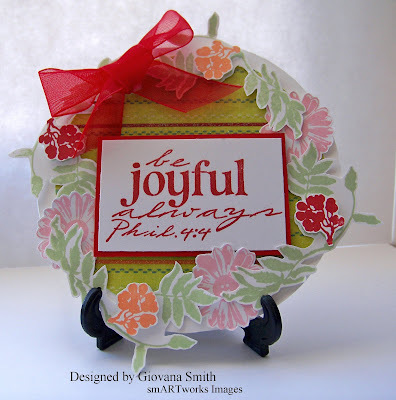 Paper: Playful Petals-Gabby from Daisy Buckets, Twitterpated-Critter Chatter from Imahinisce. Embellishments: May Art Ribbon, Yellow Button, Clear Crystals from Zva. Accessories: Sewing machine, Yellow thread, SU Dimensionals. This blog candy is now closed, the winner has been picked!! Happy Monday everyone, I hope your day is happy and bright. Today, I don't have anything to show you, it started just as any other day and ended up doing some yard work!! WHAT?!?! I was not planning at all doing any yard work, I just planned to do some projects with DD as our homeschool class, we were starting our pots and putting some seeds to start indoors, of course I explained and did most of the job, but DD was happy, (yes, not math or spelling class, she was a happy girl). Then I saw some weeds (well, a lot, LOL) so I had my rake and started raking, after a while I had a pile of weeds waiting to be moved into the burn pile, i was getting tired, feeling the heat in my face and body. I decided I should stop and get inside because I was HUNGRY!!! Yes, it was 1:10pm!!! DD was playing on the computer, (did I say playing on the computer??? ), I drank some water and made some yummy BBQ sandwiches (I love leftovers). I planned to do some stamping, (BTW MY great friend and neighbor Nicole brought me today tons of stamps!!! Thanks so much Nicole and Gary.) but I am soooooo tired and decided better start my dinner and get ready to take DD to her swim lesson. Hey, don't go yet!! I have some CANDY for you!!! Do you love CANDY???? I bet you do!! 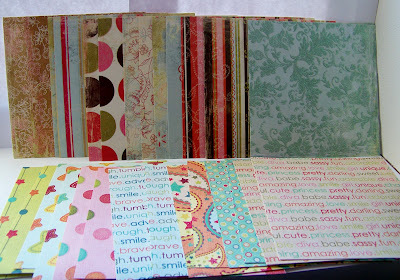 Last week I received the most beautiful Card stock Design Paper from My Mind's Eye and I want to share some with you!!! I just noticed I passes the 20,000 visitors!!! So cool!! Just leave me a comment telling me what are you planning for Easter and I will include your name in the drawing, easy peasy :) :) You have until Saturday 9pm. More chances to win, announce my blog candy on your blog and post another comment here. I will post the picture of my Blog Candy later!! You will not be disappointed. ETA: This is my Blog Candy for you!!! The paper standing is from Out & About and the one laying is from Just Dreamy Collection, both from My Mind's Eye, this is not just paper is Card Stock with glitter!! This blog candy is now closed!! Thanks! !